This 5-acre county park consists of a paved trail, boardwalk, and observation deck. 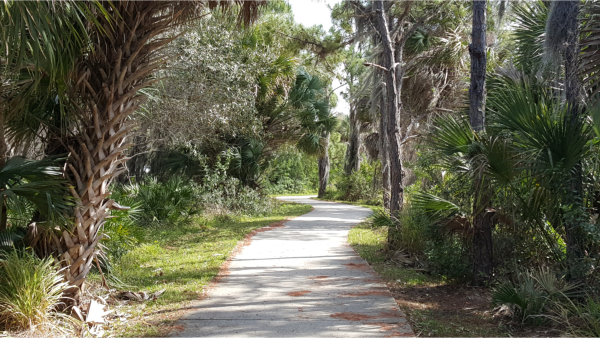 The meandering and scenic multi-use trail departs directly from The Legacy Trail at the Central Sarasota Parkway intersection and runs 0.7 miles (1.2 km) west to McIntosh Road. The 8-foot width allows easy passing for bikes and pedestrians. The trail is nicely separated from the road and dense vegetation screens the road from view for most of the trail. There are views of lakes on the south side. Other amenities include informational plaques, benches, and a wildlife observation platform. For those who prefer cycling off the road, there are several nice sidewalk routes in this area that connect with The Legacy Trail and/or Stoneybrook trail. Many of the sidewalks in this part of Palmer Ranch are very pleasant for walking or cycling because they are separated from the road and tend to meander rather than following straight lines. From the west end of the Stoneybrook Trail, continue on the sidewalk along Central Sarasota Parkway. Cross Central Sarasota Parkway at Potter Park Drive to avoid the busy Tamiami Trail intersection. A couple of small parking lots to cross as you get near the restaurant. Distance from The Legacy Trail to First Watch: 1.8 miles (2.9 km). From Culverhouse Park or the McIntosh Parking Area, go south on The Legacy Legacy Trail to Central Sarasota Parkway. Cross Central Sarasota Parkway and immediately turn right onto the Stoneybrook Nature Trail. Follow the trail to McIntosh Road. Cross back over Central Sarasota Parkway and take the sidewalk on the east side of the road back to where you are parked. Approximately 3 miles (4.8 km). From Culverhouse Park or the McIntosh Parking Area, go to the intersection of The Legacy Trail with Palmer Ranch Blvd. and take the sidewalk east to Honore. Cross Honore and take the sidewalk on the eastern side of the road to Central Sarasota Parkway. Take the sidewalk on the northern side of Central Sarasota Parkway back to The Legacy Trail, and then take The Legacy Trail back to where you are parked. Approximately 5 miles (8 km). As you can see from the map, these suggested routes can be combined in various ways. McIntosh Road: Bike lane going north only. Central Sarasota Parkway: The bike lane going west is continuous from Honore to Tamiami Trail; however, the bike lane going east has several large gaps along this section. Honore: Bike lanes are continuous in both directions. Palmer Ranch Blvd: Bike lanes both directions between McIntosh and Honore.